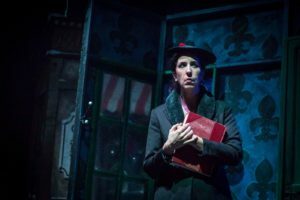 This is the fifth year that Charles Dickens’s A Christmas Carol by the Isla Theatre Project will be performed in Palma by an international cast of more than 20 actors. Over the years, enjoying the performance has become one of the highlights of the Mallorca Christmas holiday season. If you’re not familiar with the story, crotchety counter of coins Ebenezer Scrooge is visited by three ghosts from the past, present and future. They try to make him see his past mistakes and discover what might be done to change his own future. Will he remain a heartless humbug for Christmas? Or will he be persuaded to learn from his mistakes, find the good in mankind and learn the message of love and giving that defines the Christmas season? A Christmas Carol also features traditional Christmas songs orchestrated by Emmy award nominee Klaus Hellibrecht to help get you in the festive mood. No-one wants to be a Scrooge. Here are seven ways we can all help those less fortunate than us in Mallorca this Christmas. Support the Allen Graham Charity and help secure a better future for disadvantaged children and young adults in Mallorca. Enable abandoned, abused, mistreated and old horses to live happy and free at Rancho Fino Mallorca. Read more here. Donate toys to SOS Mamás Baleares. Here. Contribute to the Anima Animal Sanctuary. Call +34 616344511 or email animal.sanctuary@gmail.com. Buy a present for a boy or girl costing between €10-15 and drop it off at A ma maison in Santa Catalina or the Bikini Beach Boutique and Spa on the Passeig de Mallorca before 16 December. Join Associación Ondine here and do your bit to protect our precious marine environment. Help the crew of the Red Dragon yacht collect for the homeless. Contact Mark Stevens on +34 694487371. We’re sure there are plenty of other wonderful charitable initiatives taking place this Mallorca Christmas. Our list of seven suggestions is made up of people who responded to our question on the I Have A Question Mallorca Facebook page, an invaluable resource for all of us who live on the island. 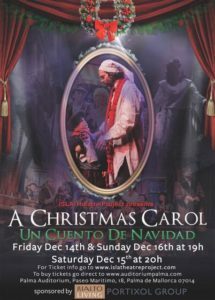 A Christmas Carol is at Palma Auditorium on the Paseo Maritimo at 19h on Friday 14 and Sunday 16 December and 20h on Saturday 15 December. Buy your tickets now here. It’s a bit early, but may we be the first to hope you have a happy, kindness-filled Mallorca Christmas! Charles Marlow has no connection with any of the charitable activities listed.